Fundraiser by Joey Thomas : Send Joey to the DNC in Philly! Send Joey to the DNC in Philly! I'm so excited to have the opportunity to go to the Democratic National Convention! 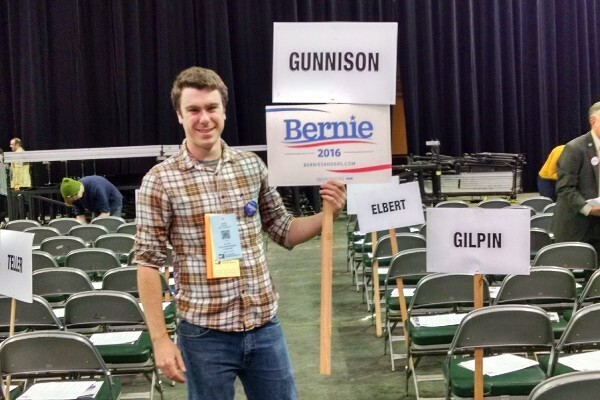 I was elected as a delegate for Bernie from the 3rd Congressional District of Colorado. This is an amazing opportunity and I'm extremely thankful to my neighbors who voted for me. As a college student who is working on my bachelor's of science in Geology and with plans to attend graduate school after I finish at Western, it will be a challenge for me to come up with the total cost of the trip. I have followed Bernie's campaign since the beginning, canvasing and getting out the vote on campus, being elected as a delegate from my precint, then my county and then my Congressional District and it will be an amazing experience to be able to attend the national convention, thank you for your support! I want to thank all of you from the bottom of my heart for your generosity and support. My experiences at the Democratic National Convention are some that I will remember for a lifetime. Knowing full well that Bernie was going to lose going into the convention, my goal and the goal of other Bernie delegates was to make sure that his progressive values got their voice. I feel confident that we accomplished this goal. I will never stop in the fight toward pushing candidates into office that accept real progressive values. Values that support working class voters, minority voters and voters of all sexualities and genders. The Democratic Party has shifted too far to the right and must be pulled back to the left. Many times as I stood in the convention hall holding a sign that stated simply "100% Renewables" Hillary delegates actively crowded in front attempting to block out my sign with "USA" signs. This party is not what it should be. How could any Democratic voter not support the movement to 100% renewable energy? For me as far as the presidential candidate goes I am looking 4 years ahead but right now I am looking local. I will work hard to make sure Amendment 69 - ColoradoCare passes. I will push our local politicians toward supporting clean water, clean air and to combat climate change. Thank you again for all your support, I will never forget how you have helped me speak for the millions of people who voted for Bernie Sanders and want to see a more progressive America. I had a 3 hour conference call yesterday with all 70+ delegates from Colorado to the national convention. This discussion was productive but I found out that the hotels are going to be $577.50 per night with a 4 night minimum! I plan to try and split a room with as many people as possible but this will be very expensive for a poor college student like myself. I truly appreciate all of the support I have received from my family and the community and am very proud to represent Gunnison at a national event. Thank you all again so very much. Thanks for your voice in Philly! !